1/2 large cabbage or 1 small one (about 5 cups), chopped thinly. In a large skillet, heat the oil. Add the tomatoes and half the ground spices. Let the sauce cook until it has thickened slightly, about 10 minutes. Add the cabbage and stir until coated with the tomatoes and spices. Cover and cook on a medium-low flame about 15-20 minutes until quite tender. If you are using fresh peas, add them now. If using frozen, wait another five minutes until the cabbage is completely tender, then add. Once all the vegetables are cooked, add the remaining spices and salt to taste. Add the dill and mix thoroughly. 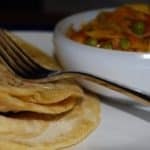 Serve piping hot with the Sweet-Aloo Paratha.